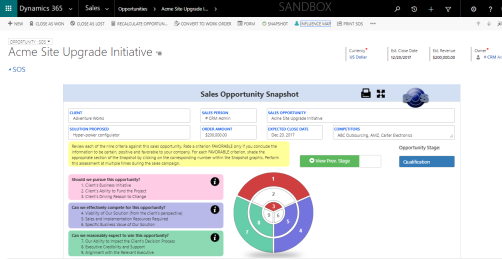 CloudFronts has recently developed a Sales Methodology App for Dynamics 365 Sales for our Partner, Technical Sales Development (TSD). The App supports a recognized Sales Methodology which can help you increase revenue and win-rate by properly qualifying and managing deals, developing competitive and stakeholder strategies, creating a financially sound value proposition, and planning actions to close the deal. This App on top of Dynamics 365 Sales is already in use by a large global B2B organization, who has utilized the Sales Methodology for 10 years, and experienced a 16% increase in revenue and 22% increase in win-rate. This App is applicable for any size B2B organization doing complex sales. + Dynamics 365 Sales - Better together! Microsoft Customer Insights: Use the power of Azure Machine Learning and AI. Leverage the power of the only Marketing Automation platform that works within Dynamics 365 , Manage your Sales Pipeline using Dynamics 365 Sales and follow a proven sales methodology using the SOS App for D365 Sales. Please fill your details to download the Sales Methodology for Dynamics 365 Sales e-book.